The Spangler team received its second Heartland Chapter Emmy Award last Saturday night at the awards gala held in Denver, Colorado. The award was received for the half hour television special – Spangler Science and Weather at Coors Field – that aired on KUSA-TV 9News in Denver, Colorado. But this award is extra special for the Spangler team because we share it with our own Bradley Mayhew who is credited on the Emmy as the editor. The television special documented the first ever Weather and Science Day at Coors Field 2009. It was at this event that the Spangler team received its first Guinness World Record for the Large Physics Lesson – conducting a hands-on science demonstration with 5,401 people all at the same time. 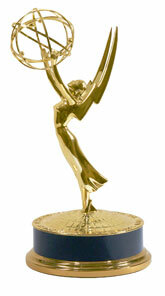 Our first Heartland Chapter Emmy Award was awarded in 1997 while I was working at KCNC as the host of News for Kids, a nationally syndicated show that aired every Saturday morning.